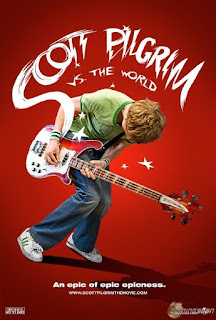 A feast of sight and sound for 8-bit gamers, the screen adaptation of the graphic novels, Scott Pilgrim vs The World was made for people like me (ie I edit this blog). I present this review as unbias as possible and ask: was the innovative, daring, and medium-bridging magic of the film more than a gimmick? Yes and no. 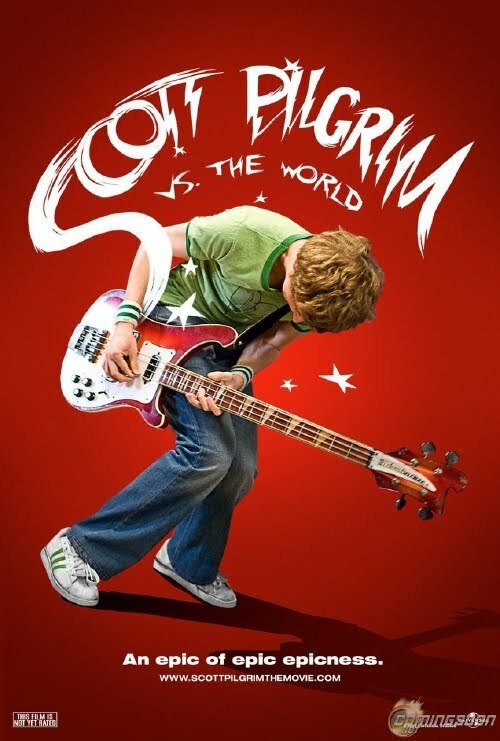 Scott Pilgrim (Michael Cera) is a 22 year old dorky slacker-geek, dating a Chinese high schooler named ‘Knives Chao’ (Ellen Wong), but falls for the mysterious Ramona Flowers (Mary Elizabeth Winstead). However, Ramona is a woman with a past, In-universe magic turns Scott Pilgrim’s life into an epic 8-bit video game and in an homage to every video game ever made, Scott must ‘defeat’ (not kill, ‘defeat’) her seven, distinctively themed “evil ex’s” in order to win her affection. The first problem I have is the timing of how the ‘magic’ in the film’s universe changes gears from being a quirky compliment, to a major plot device. During Scott’s first major fight scene his opponent is the ethnically Indian ‘Matthew Patel’ (perhaps done as a nod to Dhalsim in Street Fighter 2, since people always play as Ryu and the first of seven pre-boss opponents is usually the Indian fighter who uses fire and defies gravity). The problem arises as Patel performs what I can only describe as a floating pre-fight bollywood-style dance routine, and around that time we learn Scott has six other ex’s to defeat. It’s a bad sequence on a few levels, and the audience is left to think ‘I have to sit through six more of these?’ Those who left the cinema probably did so at this point; when screened to a room of people watching the film for the first time, you’ll see a communal feeling of ‘oh, this film really isn’t for me’ wash over the room like a wave. My only other nagging problem is the ending. For those of you with the DVD with the option of the ‘alternative ending’, the alternative ending is the right one, which I suspect was rejected by ‘test audiences’ in favour of the nonsensical one which will play otherwise. As soon as you see ‘Nega-Scott’, the evil version of Scott (a nod to the "Mirror Match"), immediately hit the ‘menu’ or ‘title’ button on your DVD remote, go to ‘extras’ and play the alternative ending. Otherwise you’ll be left to sit through an ending which completely undermines the premise and motivations of the characters, leaves a horribly lampshaded loose end and creates an awful message. For the love of cinema don’t ruin this otherwise good film by seeing the focus-group-friendly version. I should add that, unfortunately, the ‘right one’ isn’t perfect, but does at least not make you resent the rest of the film you should have otherwise enjoyed. A good film kept from being great by minor problems. Clever screenplay, and authentic performance from Michael Cera, great art and visuals, and an innovative incorporation of one medium into another make this a worthwhile film especially for its intended audience. Power through the feeling of detachment you’ll get about half way through, and you ought to enjoy this light hearted and wickedly funny tribute to gaming, comic books, and everything. A simple and accessible review of new films on the big screen and DVD releases. I grade films using stars, but it is important to keep in mind that the star ratings are categorical, not sequential: a four star film is not twice as good as a two star film and so on. See the guide below for more information on the meaning of stars. Past reviews are archived in alphabetical order (excluding articles 'the', 'a', and 'an'). Good luck, and happy viewing.